1. 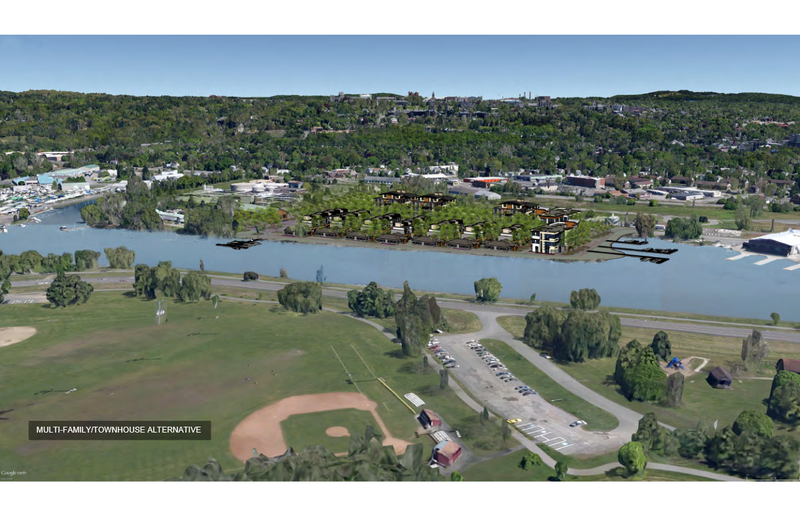 We’ll start off with about the only affirmative news this week, that of the city of Ithaca Planning and Development Board Meeting last Tuesday. 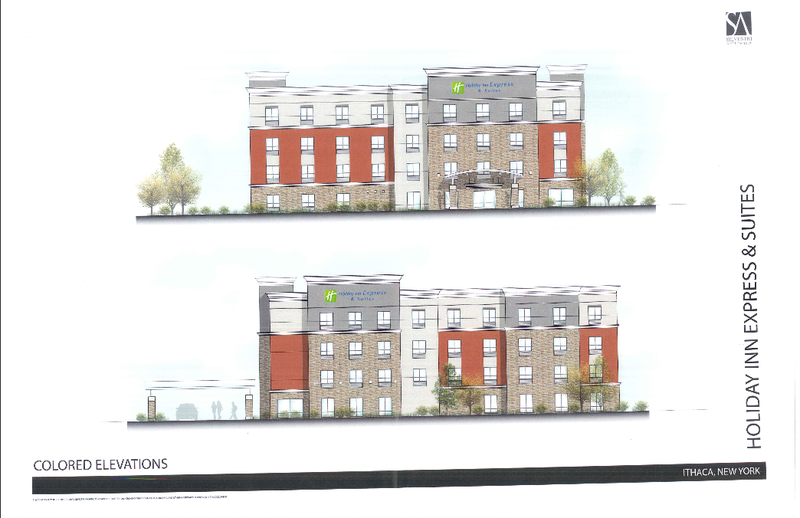 The tweaks to the now 79-room Holiday Inn proposal at 371 Elmira Road were approved, and the project expects to have building permits in hand next week, according to the Times‘ Josh Brokaw. 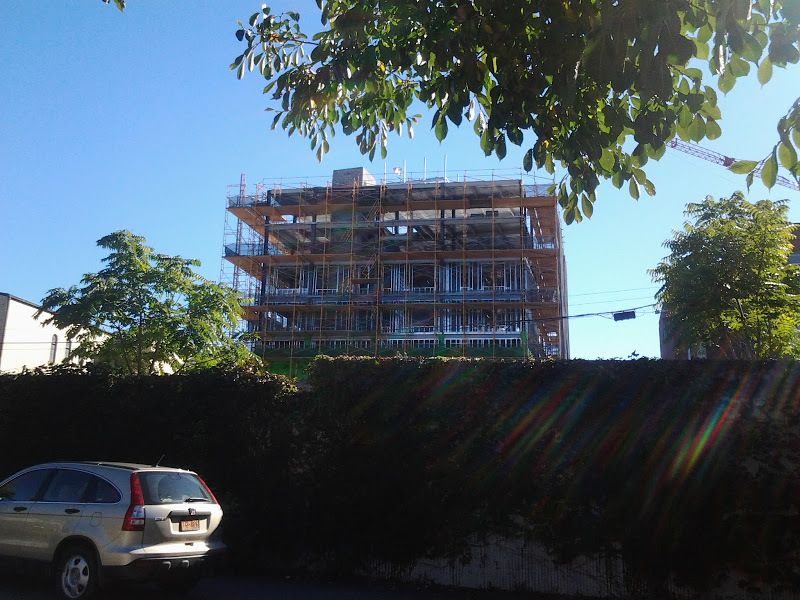 When I spoke to the development company’s president, he said “the project is already underway”, but it seems he meant demolition permits for the existing buildings, rather than construction permits. 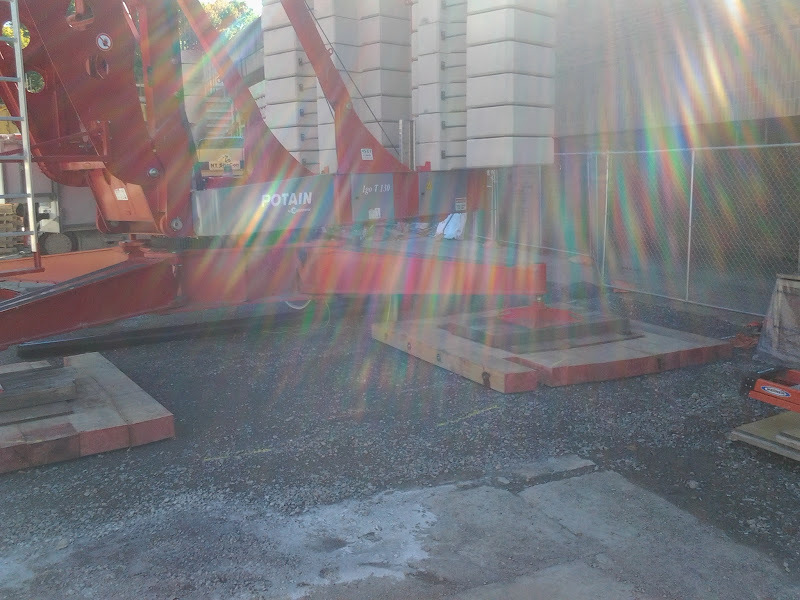 Expect a construction update sometime next month. 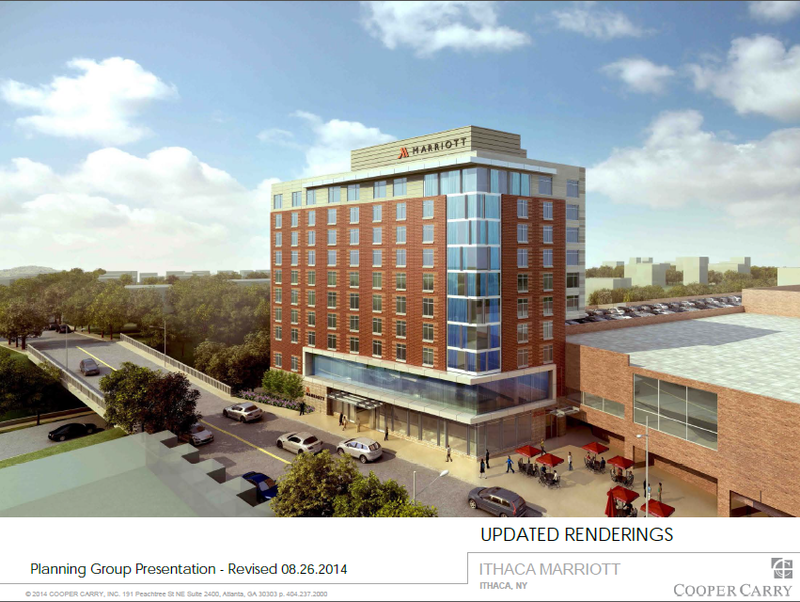 Also approved was the new north wing for the Hotel Ithaca at 222 South Cayuga Street in downtown. 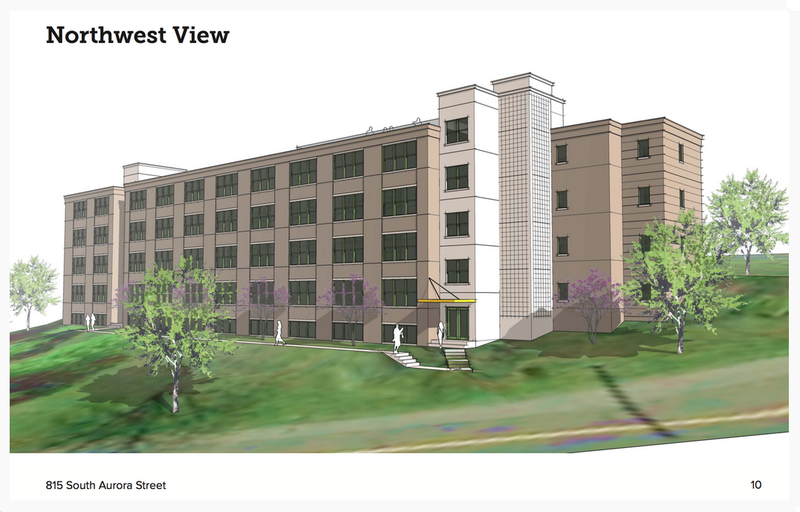 A tweak of the facade, glazing and balconies was enough to placate the board into approving the revisions for the $9.5 million, 90-room project, which replaces a two-story wing dating from 1972. 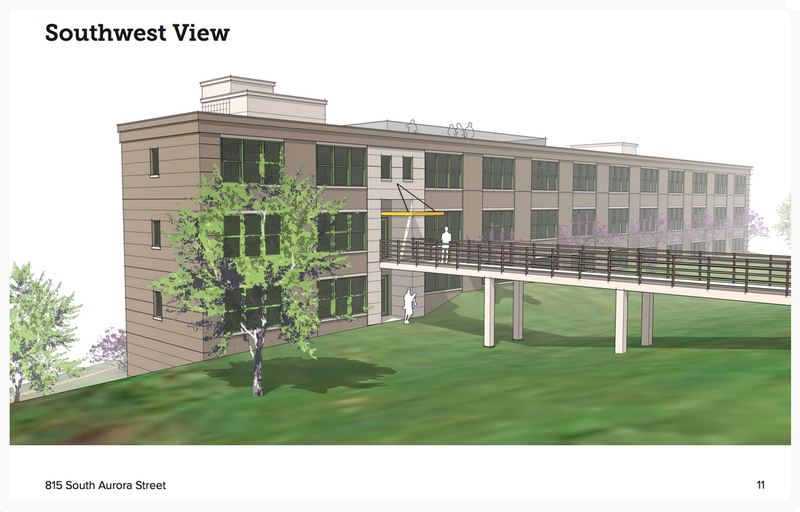 The north wing will have the potential for another three floors, and on the other two-story wing, the long-awaited Conference Center may come to be if financing plays in developer Hart Hotels’ favor. 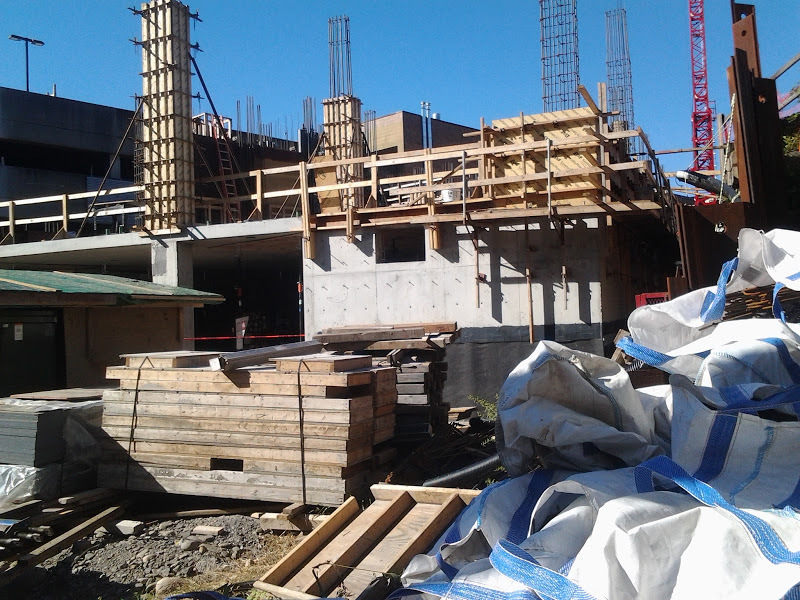 The Buffalo-based company hopes to start construction early next year and have the new wing ready for its first guests in Fall 2016. 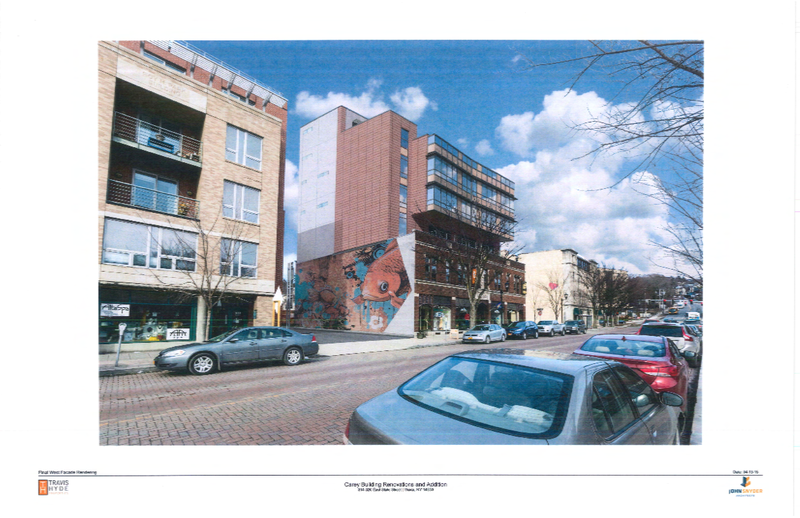 Meanwhile, in the strike column is the proposed jazz bar at 416 East State Street just east of downtown. 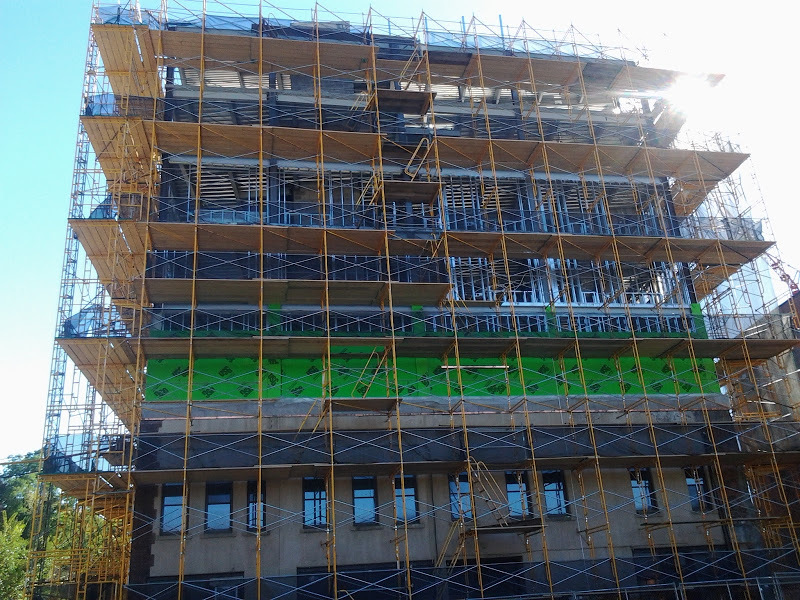 According to the Cornell Daily Sun, a decision is being deferred until updated, more thorough information is provided regarding sound attenuation of bar patrons gathering outside the building while getting their fresh air or nicotine fix. 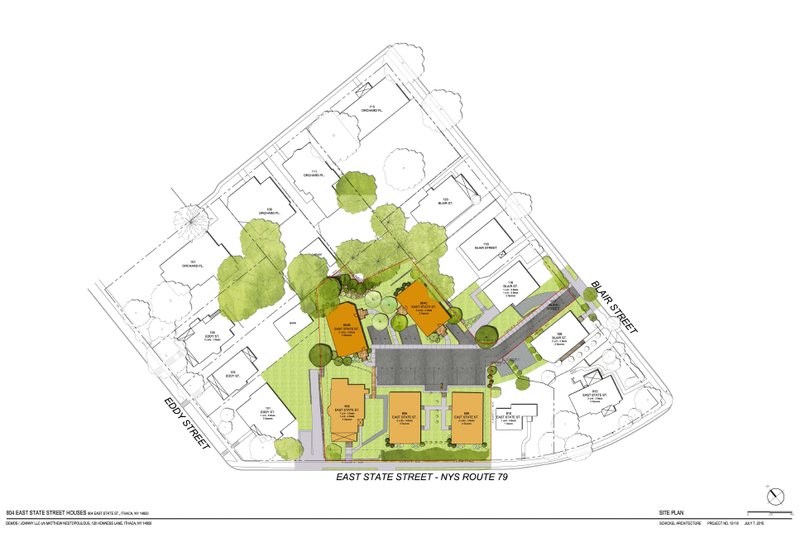 Neighbors have mounted substantial opposition to the project for being out of character and for parking concerns, but the planning board has played neutral, receptive but cautious. 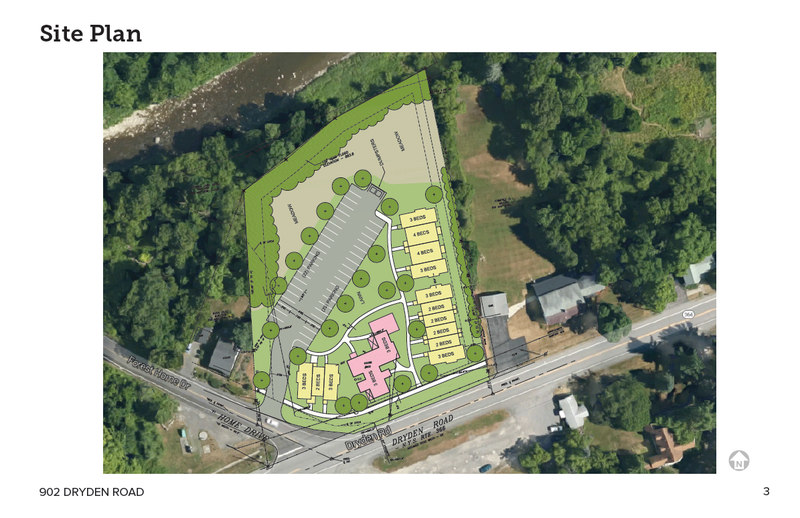 The project is a legal use and will not change the square footage of the one-story warehouse/office building, but will need zoning variances. 2. 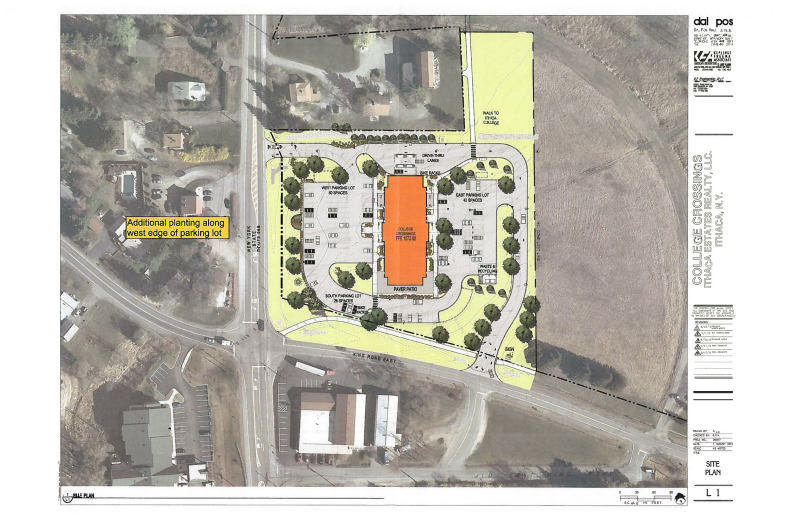 The county had discussion, but made no judgements on the Biggs Parcel next to Cayuga Medical Center. 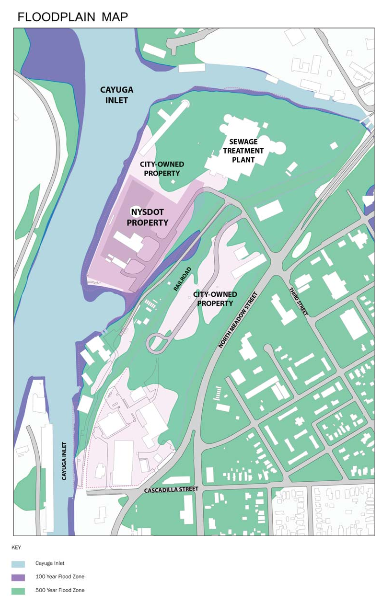 The county is mulling plans to sell the parcel on the open market after years-long and heavily-fought plans to sell it to affordable housing developers NRP and BHTC fell through on the discovery of extensive wetlands on-site in 2014. As written about in the Voice this week, the county wants the 25.52 acres of land (previously valued at $340k) back on the tax rolls, while the neighbors and some other West Hill residents, under the umbrella of the Indian Creek Neighborhood Association, want the county to hold it as “public woodland”. The county has countered (time and again) the land has no use for the public. 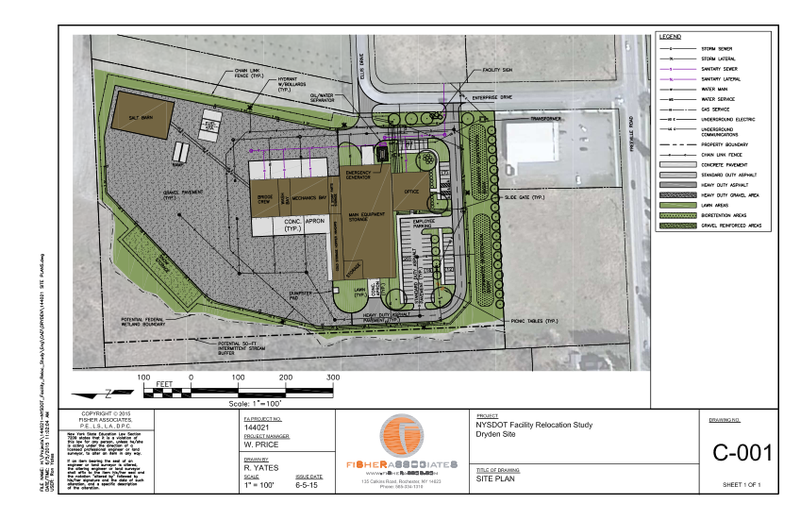 Depending on which account one chooses to follow (ICNA’s or the county’s, the two vary on the details), the county’s Government Operations Committee is giving the neighbors one month to come up with a viable alternative for the land. The ICNA wanted an RFP for land preservation, but the county’s planning commissioner, Ed Marx, says the county doesn’t have time to write-up another RFP. 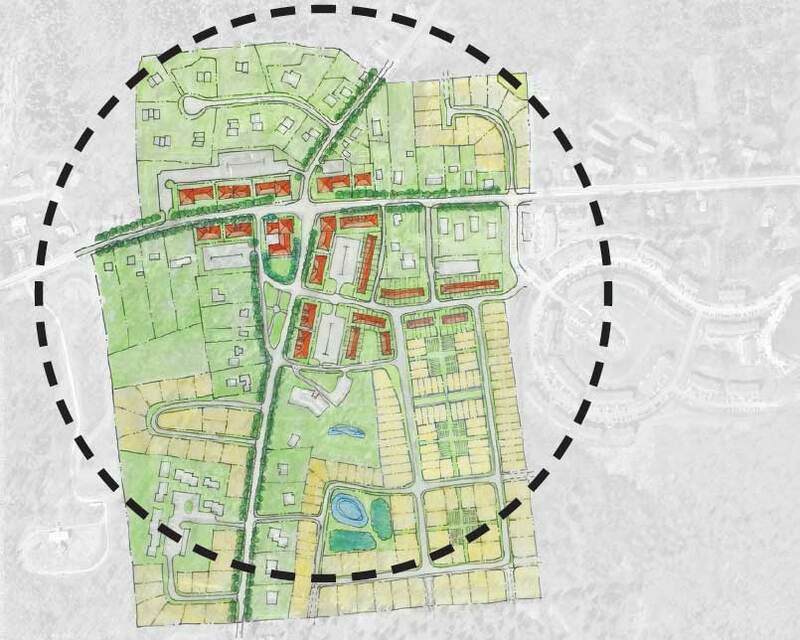 They also pushed for subdivision of the land, which the planning department is also discouraging. 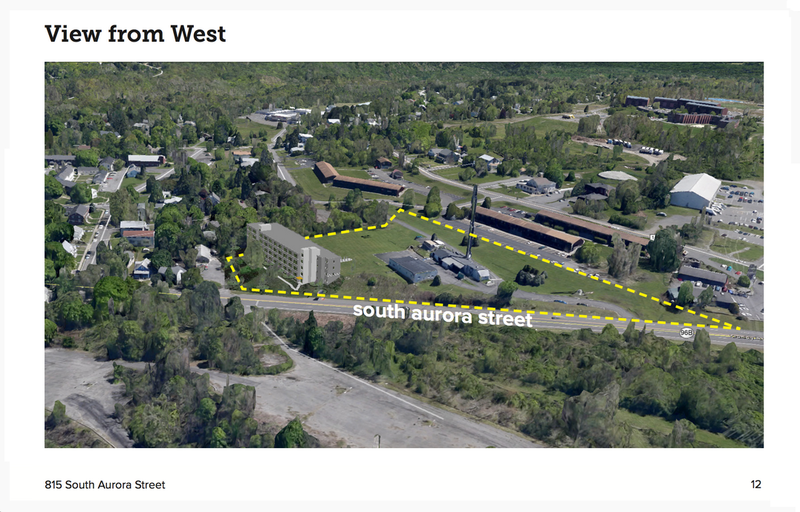 The county has wanted the ICNA, Cayuga Medical or BHTC to buy the land, but no one’s made offers. 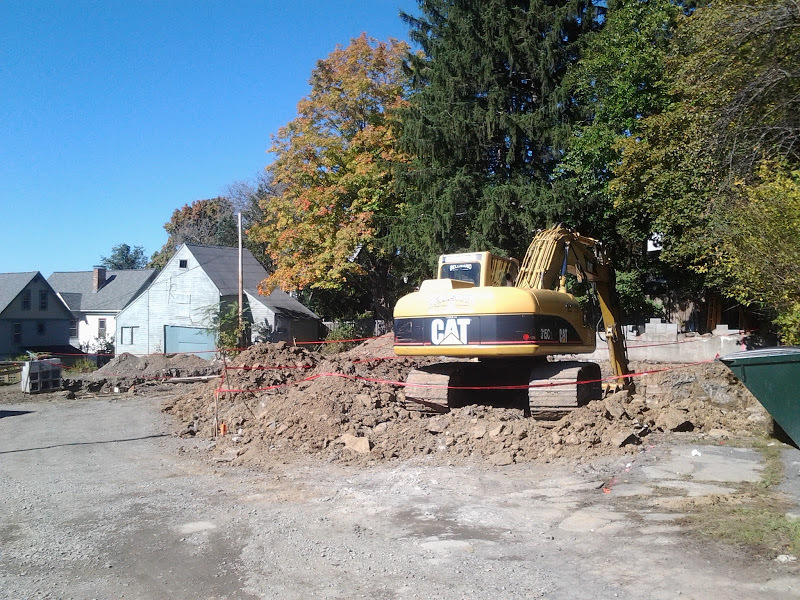 To this semi-trained eye, the only “happy” solution would be for the ICNA or someone sharing its interests to buy the property for the re-assessed value and arrange to donate it to an organization like the Finger Lakes Land Trust. The county gets their tax money, and the neighbors get to keep the land undeveloped. Outside of that option though, either the neighbors are going to feel shorted, or the county’s tax watchdogs will be up in arms. EDIT: And now I’ve been informed that the land would be tax-exempt if given to the land trust. So there’s no happy solution unless a private landowner buys it agrees to not develop it. 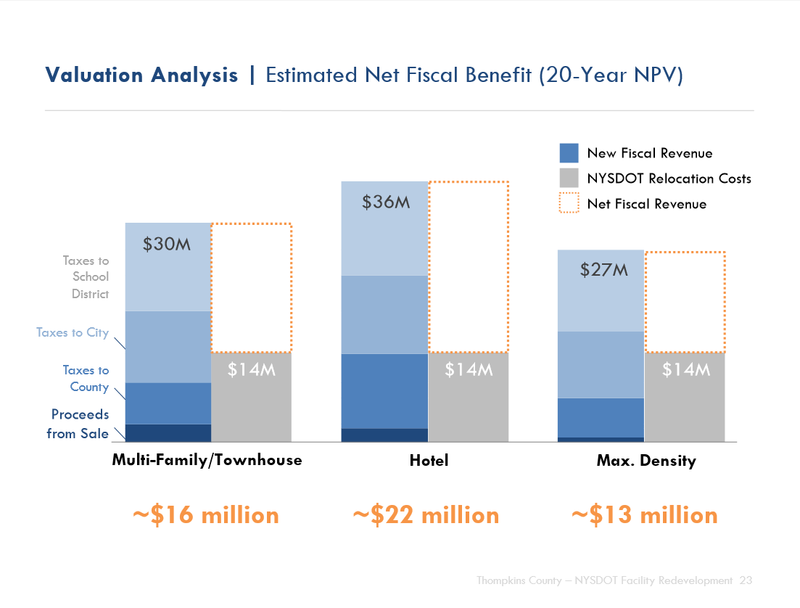 Which, given the property tax, is not very likely. 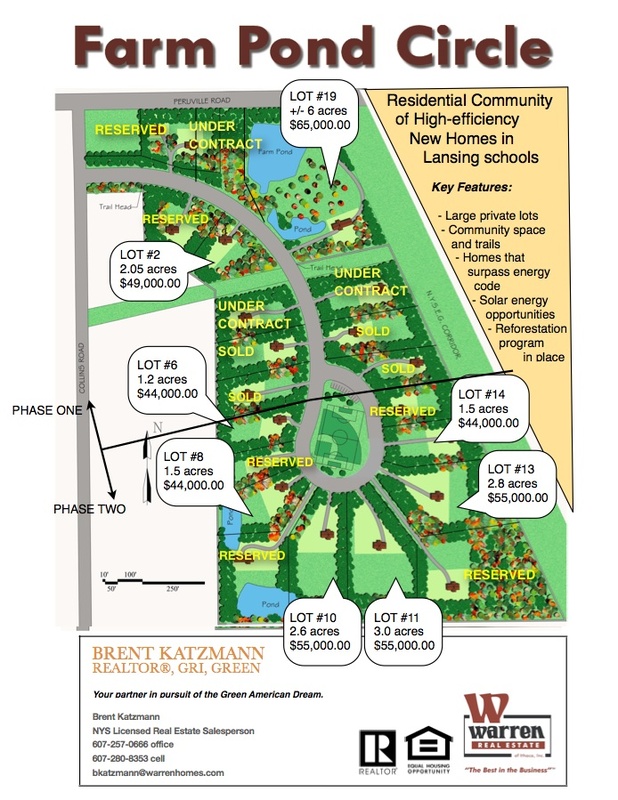 “The second phase of Lansing’s 21-lot Farm Pond Circle development is up for sale. Jack Jensen, the original developer, passed away last fall. 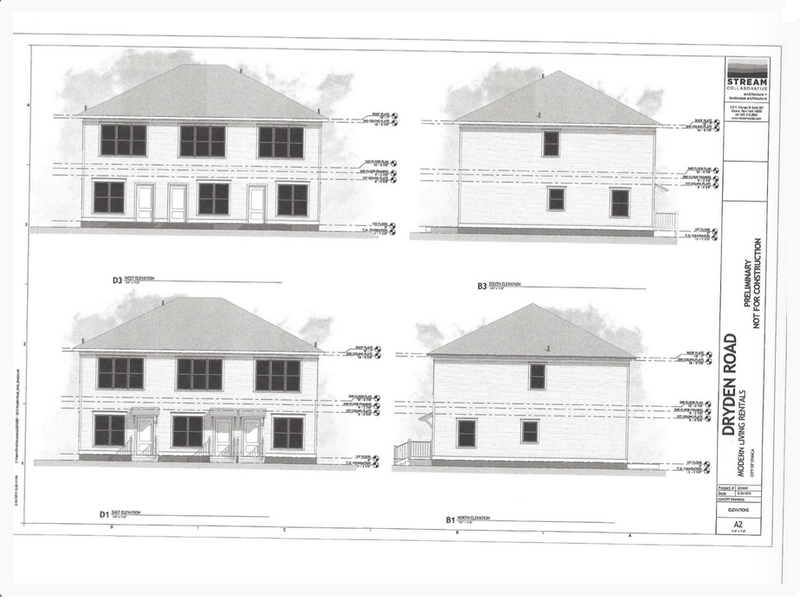 Of the ten lots in phase two, four have already been reserved; there are also two lots left in phase one. 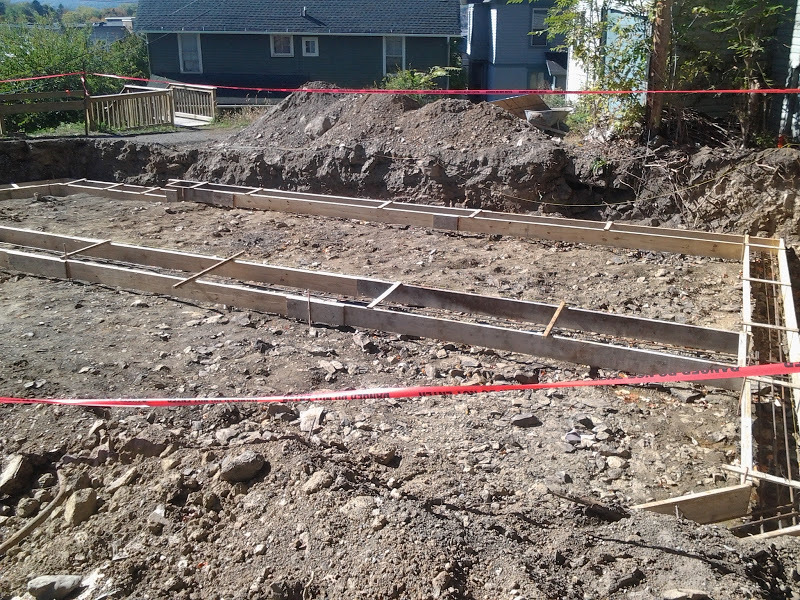 The second phase is being offered for $155,000. 4. 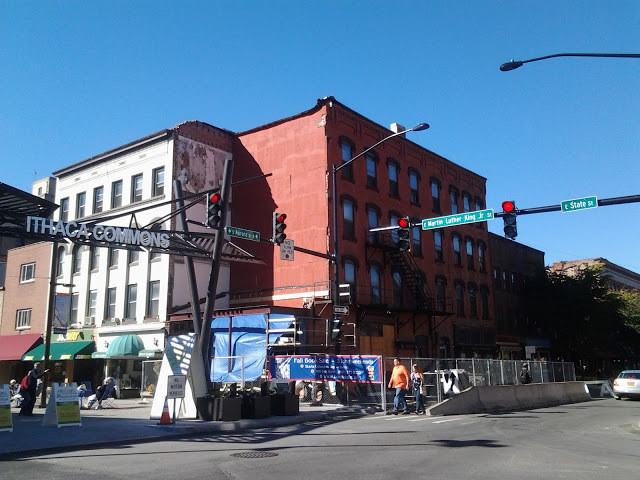 Mayor Myrick made some thought-provoking comments (or provocative, depending on your view) in a phone interview with the Times’ Josh Brokaw about State Street Triangle. For one, the inclusionary zoning topic has come up again, something likely to make an appearance in his second term. 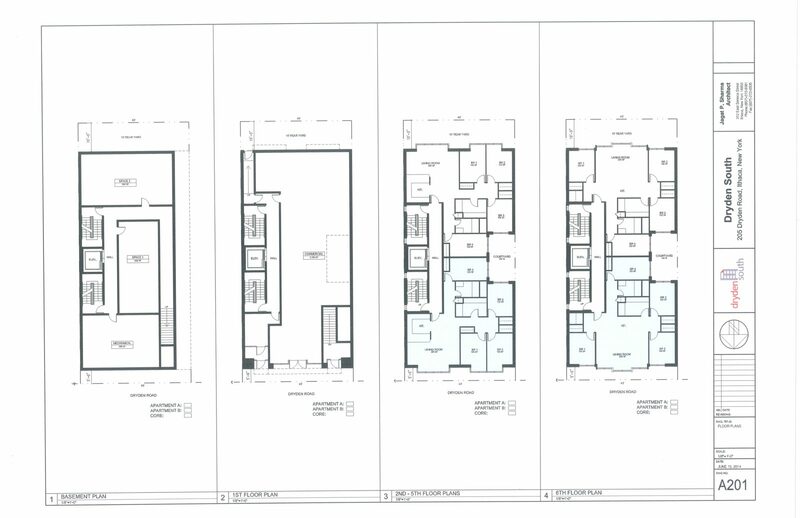 And for two, calling for a distinctive “pillar” with fewer units, and smaller units sizes to appeal to a wider, non-student part of the market. 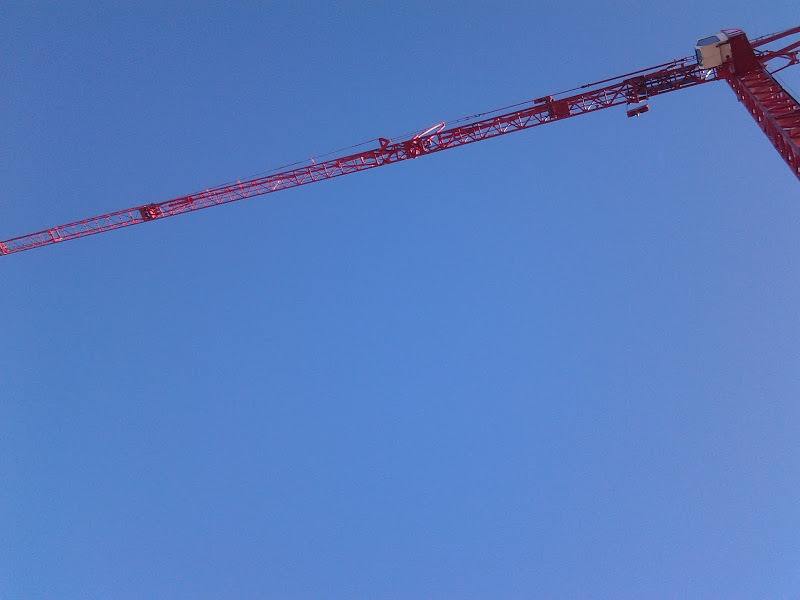 As previously stated, the 11-story height isn’t the issue. I wrote about inclusionary zoning as part of an interview with Community Planner Lynn Truame in the Voice – it can be done one of two ways, either saying a builder/developer can’t build anything without having units or paying into a fund, or by giving them an extra incentive, like reduced permit fees, being able to build one floor higher or a reduction in parking requirements if they include affordable housing. Most opt for the latter approach. 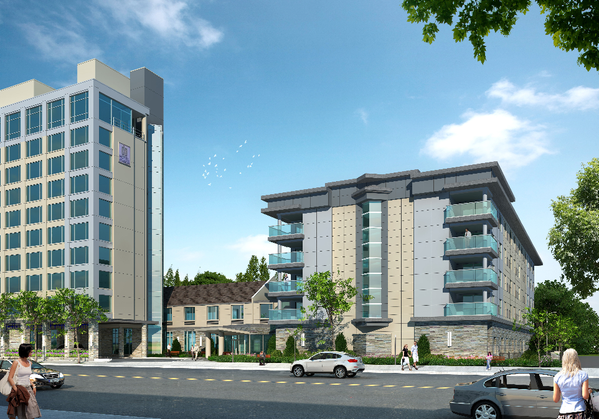 The pros are an integration of affordable units into market-rate developments and a supply of affordable housing. The cons are that, if handled the wrong way, it can stop all development, affordable and market-rate, and on the other end of the spectrum, if the benefits are too generous than it can reduce the supply the affordable housing by tearing down older, lower-cost buildings in favor of new higher-cost ones with a small number of affordable units. In sum, nothing in an inclusive zoning ordinance can be taken lightly. “The program applies to all new market-rate developments of 5 or more homes and to any converted non-residential structures that result in at least 10 homes. The affordable housing set aside is 15 to 25% of the units, depending on the average price of the market-rate homes – with the higher percentage placed on the most expensive developments. The ordinance does not allow fee in-lieu payments or land donations, but will allow developers to provide the affordable housing off-site at 125% of the on-site obligation. The ordinance provides a range of incentives including fee waivers and a 15-25% density and lot coverage bonus. Affordable homes are targeted to households earning 75% or less area median income (AMI) and rented at 65% or less AMI. Developers can sale or rent the homes for more as long as the average of affordable homes sold or rented are at or below the target household income. Affordable homes are price controlled for 99 years. 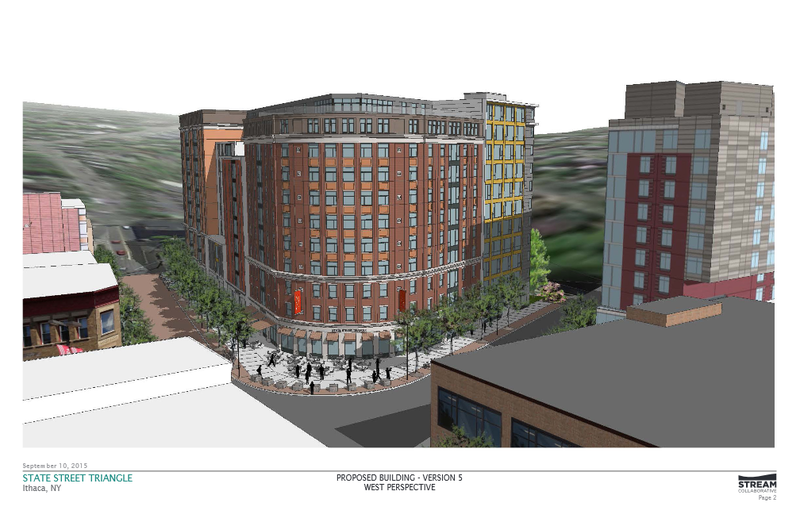 So if this were Ithaca for the sake of equivalent example, let’s say a developer downtown is thinking of a 40-unit market-rate non-luxury apartment building, that maxes out the lot area and height of a currently-existing (hypothetical) zone. They would be able to build 46 units/15% larger as a bonus, but 6 units would have to be affordable housing. They could also build 46 market-rate units on-site, and build 8 affordable units off-site at a location okayed by the city. 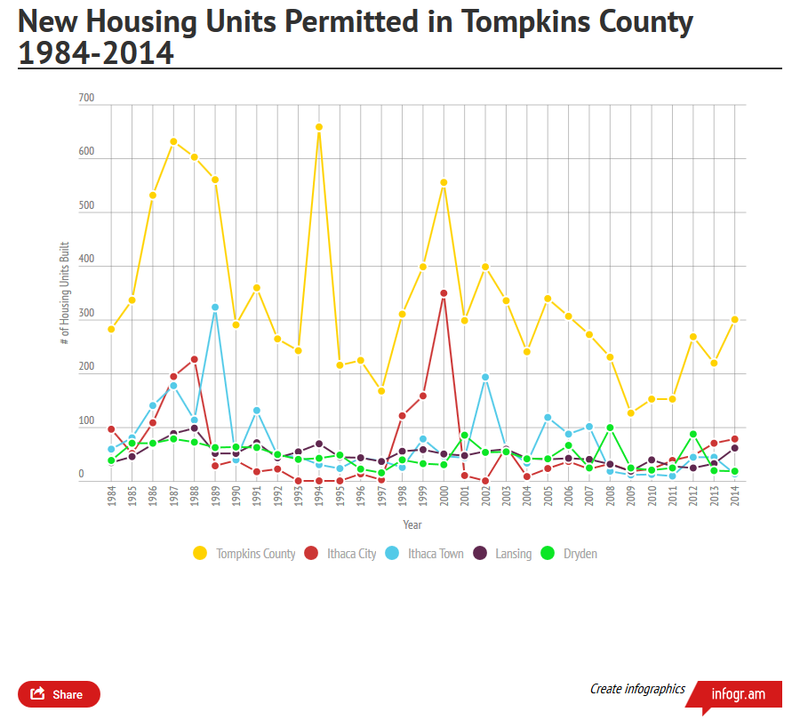 The affordable units would be targeted at individuals making 65% or less of AMI, which in Tompkins is 65% of about $53k, or $34,500/year. 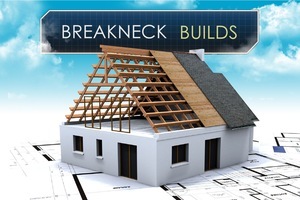 Some units could be more or less affordable, as long as they average to 65% AMI. It stays that way for 99 years. The units would be managed by an organization like INHS. Or, the developer could build a hotel, office, or non-residential building without giving up money or space for affordable housing, but they also get no zoning bonus. 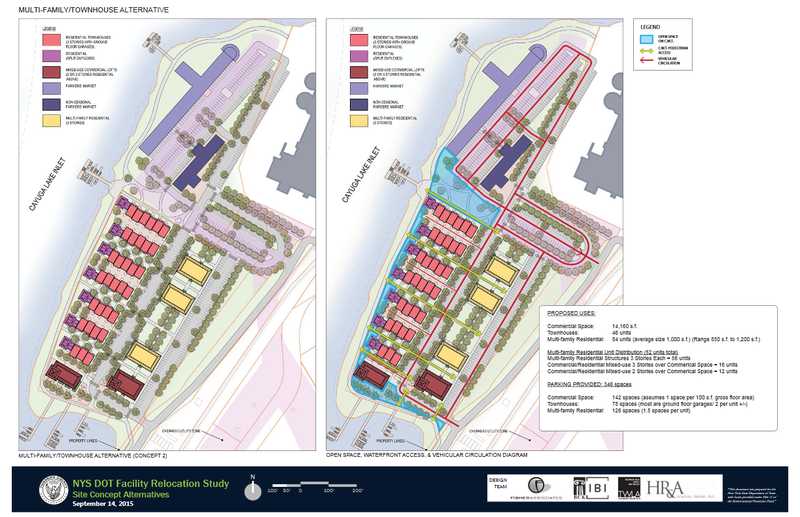 Burlington’s law isn’t designed to be a barrier for development, it’s designed to be an incentive to include affordable housing in new projects. 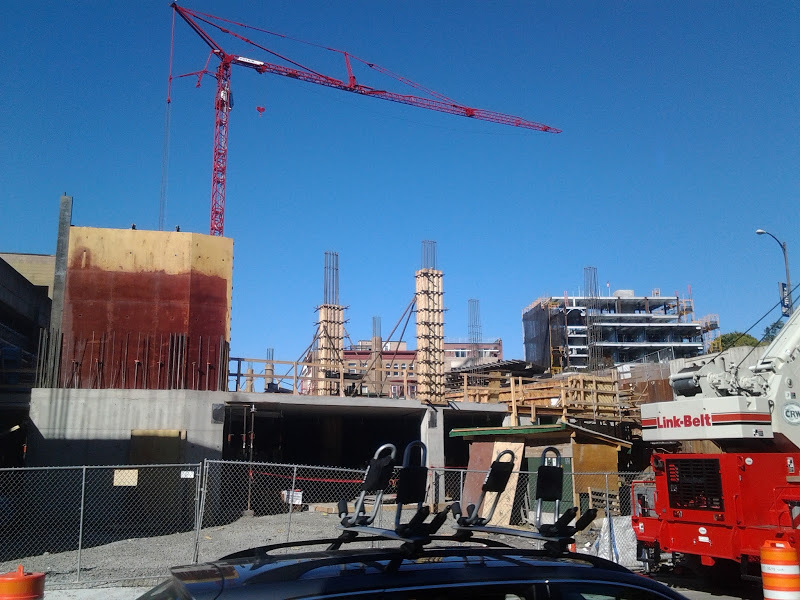 However, there are definitely opponents to inclusionary zoning even among affordable housing advocates, who say that a revised and expanded Section 8 program would be more effective. Note that Burlington’s law is just one example. No one ordinance fits all municipalities, and each community has its own aspects to address – in Ithaca’s case, that means tailoring the inclusionary zoning for each neighborhood, determining what size and types of projects have to pay into the fund (because Cornell will probably file a lawsuit if it affects their projects), establishing affordability guidelines that encompass both poor and middle-income families, and whether fees can be paid into a housing fund in lieu of housing. 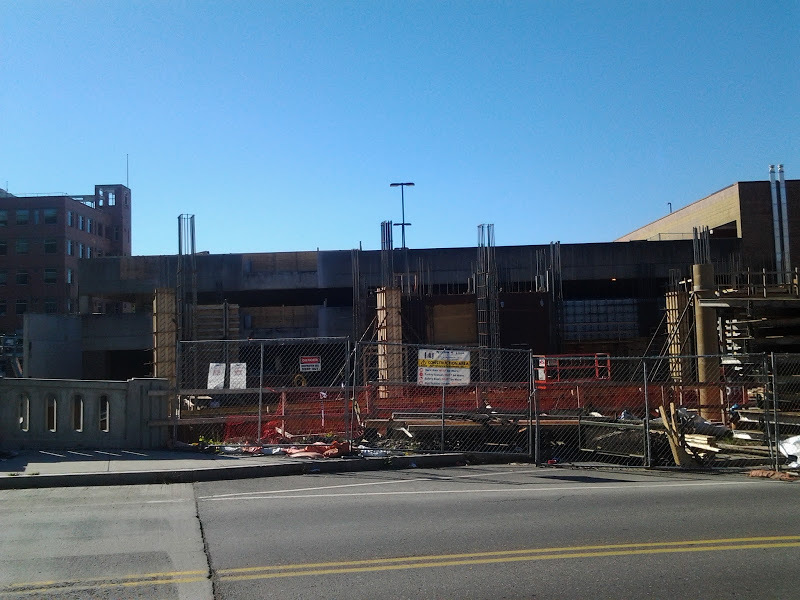 What works in Downtown probably won’t work in Belle Sherman, and what works in Fall Creek wouldn’t be effective in Collegetown. It’s going to be an intensive design process. So, back to the original question – is Campus Advantage willing to play? It’s not one that anyone can answer just yet. The Austin-based company is still determining their next move. The Times, as well as commenters on this blog, have raised the possibility that this might be the mayor playing politics to stave off his write-in opponent and the anti-development crowd that supports many of the independent candidacies. But, barring some left-field shocker on Tuesday, expect Myrick to be sharing more of his and his staff’s zoning ideas in the next couple years. 5. 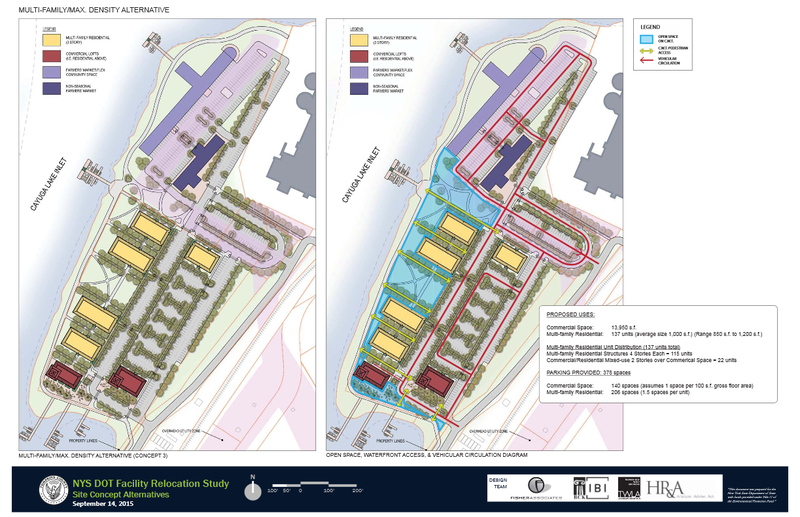 Speaking of zoning, the city is mulling over a zoning tweak to make buildings on the Commons have mandatory active street-level uses. A copy of the memo is here, Full Environmental Assessment Form (FEAF) here, county memo here, copy of code revision here. It seems like an easy sell from both the angle of developers and the city, but the steps to codify it are only now underway. It will be similar to inner Collegetown’s MU-2 zoning. Permitted are stores, restaurants, banks, entertainment venues, public assembly areas, libraries, fire stations, and anything approved by the Planning Board on a case-by-case basis. The last part comes into play because the Finger Lakes School of Massage proposes a student-staffed massage parlor on the first floor of the Rothschild’s Building. 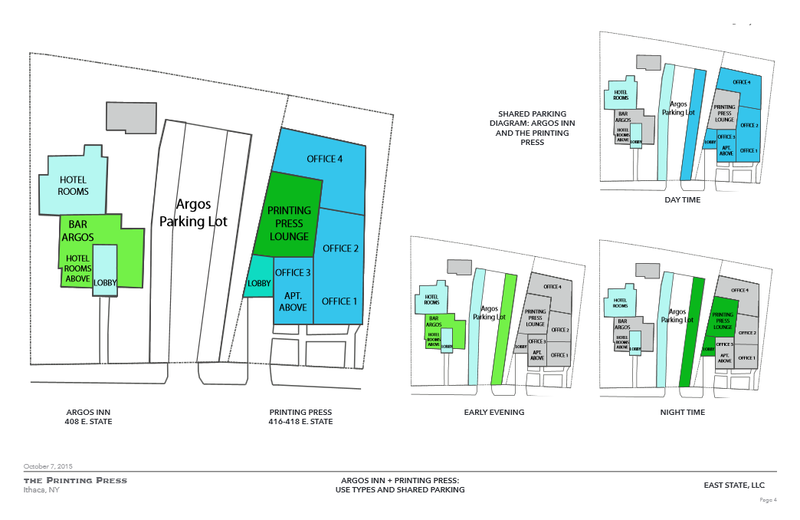 Not included – schools, certain office lobbies and apartment/condo lobbies. But most building owners moved to active-use on the Commons a long time ago. The public hearing will be November 19th. 6. Looks like there are still some hang ups with the Storage Squad and 902 Dryden projects out in Dryden, according to the town’s latest meeting. For the Storage Squad project, it has to do with their concerns with a stream that showed up on a DEC map in 1940 but hasn’t appeared since (they have to prove doesn’t exist, and proving it requires DEC acknowledgement). The business owners were also concerned about spending $30k on a Stormwater Pollution Protection Plan, with the possibility that the town may have them redo it at no small price. Now, the Dryden town board is feeling a little heat right now because there have been accusations the town isn’t doing enough to help small businesses, allegations the “rainy day” fund’s depleted, and there’s a 13% tax levy increase planned, none of which sit well with voters. Plus. lest anyone forget, elections are coming up. So it’s perhaps with those things in mind that the town board is making an effort to try and help the owners of the Storage Squad before they throw in the towel. They invited them to the town’s meeting on the 29th to discuss the SWPPP further, and we’ll find out if it was fruitful. 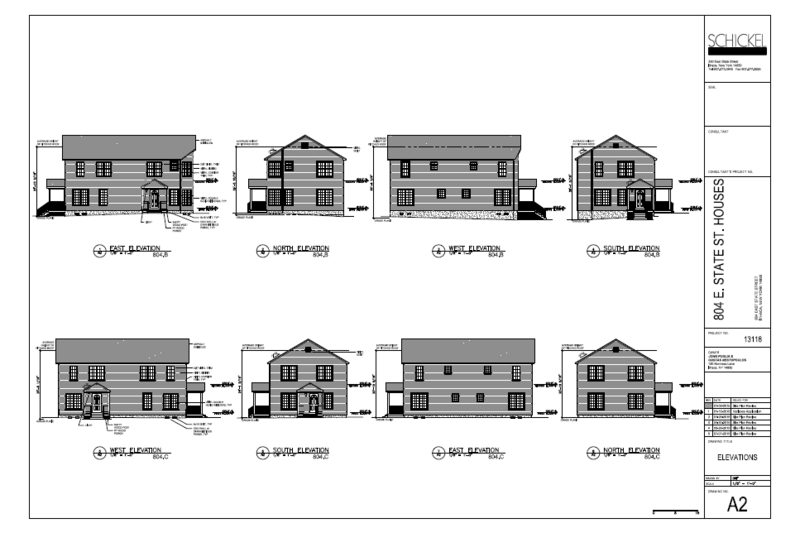 Also, the 13-unit, 36-bedroom (15 units/42 bedrooms if you count the existing duplex) 902 Dryden project was berated by its potential neighbors once again. 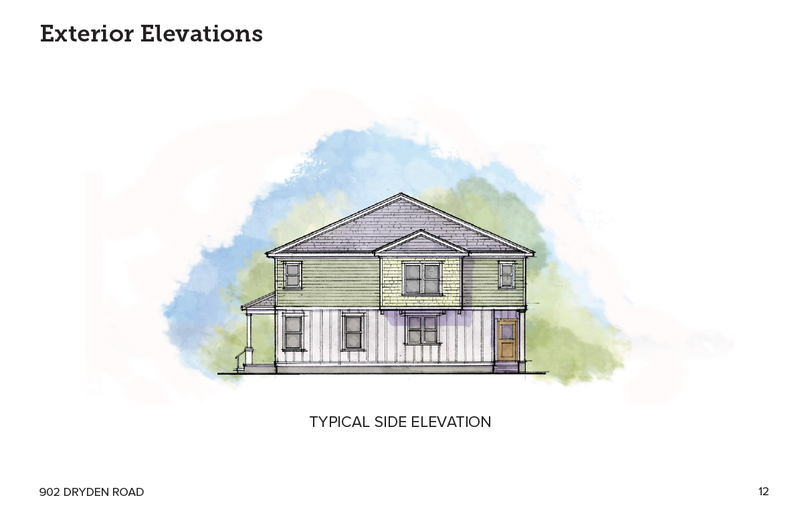 There are a couple comments attacking the potential students that would live there, but most seem to be against the location and concerns about flooding. Then you have the guy who called it a cancer. One speaker says that residential development is a tax burden on the town, but really that depends on the type of housing – infill lots and denser acreage can be cost-efficient. 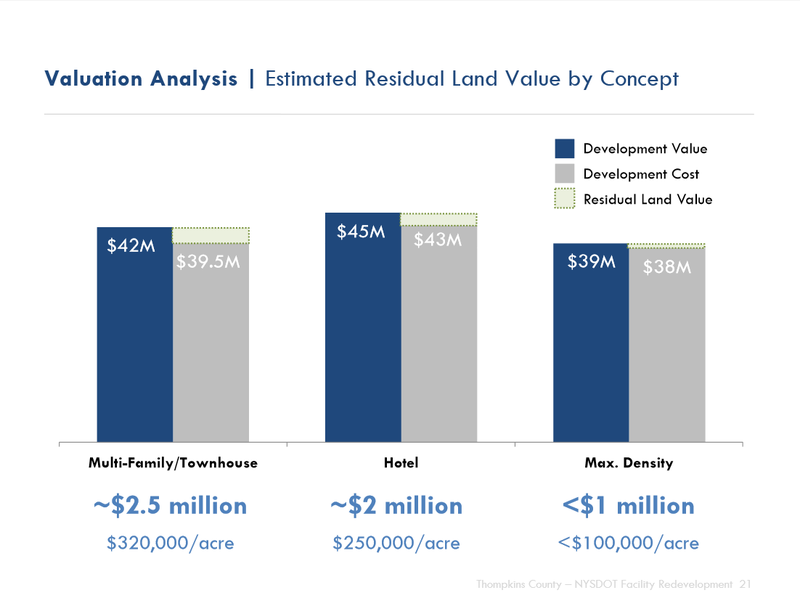 New, low-density “greenfield” housing requires more pipes, power lines, new roads…infill has much of that already in place, and less acreage per unit can yield greater cost efficiencies. Plus, the commercial development the speaker touts also requires police and fire, and indirectly schools for its employees’ families. Yet, he didn’t offer a single word of support for the Storage Squad proposal. Then the talk turns to taxes, and a guy references how we took land from Native Americans, Socialism will cause our nation’s collapse, and how Muslims are trying to institute Sharia Law. Now, how does one type those town board minutes and keep a straight face? 7. One last no for the week, this one for the Phi Mu sorority from Cornell. I still have a soft spot for the histories and houses of Greek Letter Organizations (GLOs), although I’ve happily aged out of college life. 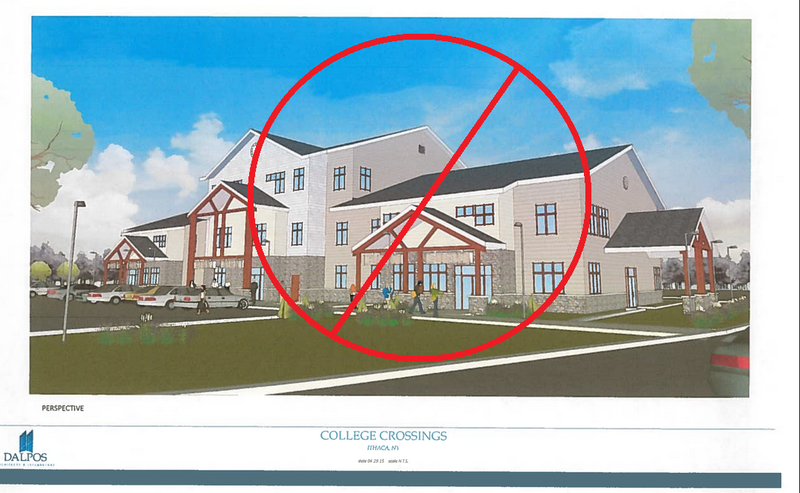 The sorority (technically a fraternity), which arrived to Cornell’s campus last year, had intended to buy the $725,000 house at 520 Wyckoff Road, but the village board shot down the change of use required. Noise, traffic and “detriment of character” were cited as reasons not to let the ca. 1924, 3,473 SF home be used for group housing. Following the decision, the board broke protocol and began a philosophical dialogue between its members and the public. Board member Sean Cunningham suggested the village has become anti-change and anti-sorority, and was at risk of “burying their heads their heads in the sand” to the point where the village wouldn’t be able to maintain its quality of life from an unwillingness to change. 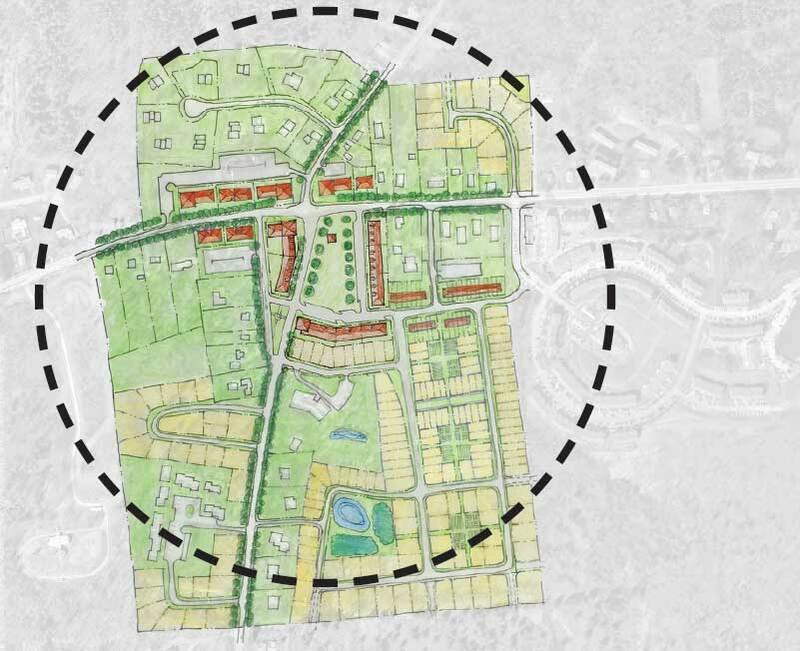 Historically, the neighborhood of Cornell Heights, split between the city and the village, has been fiercely opposed to any change of uses, let alone new buildings. Cornell sued residents in the 1980s, and won, over a similar issue. 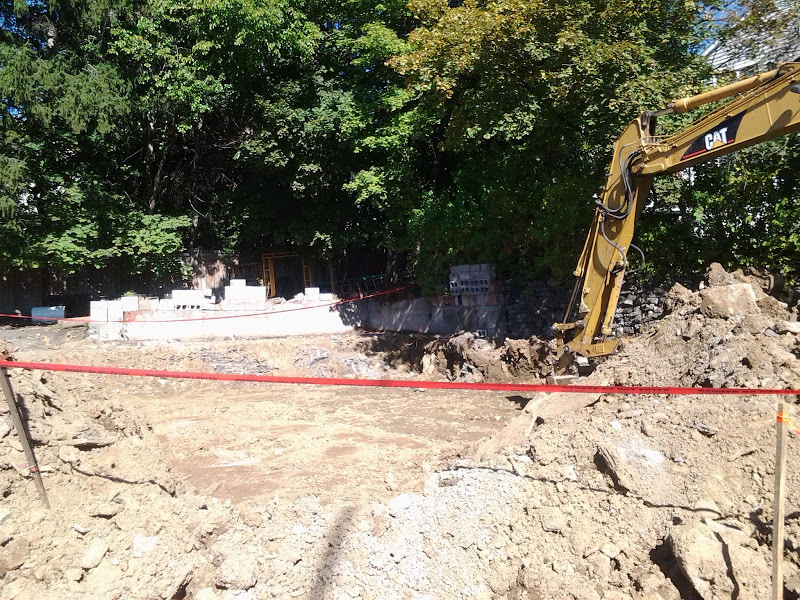 The university had planned to move its 15-member “Modern Indonesia” research program and literature collection from 102 West Avenue to a house on Fall Creek Drive, but neighbors convinced the city of Ithaca that it would greatly damage the neighborhood’s character. The state supreme court disagreed. 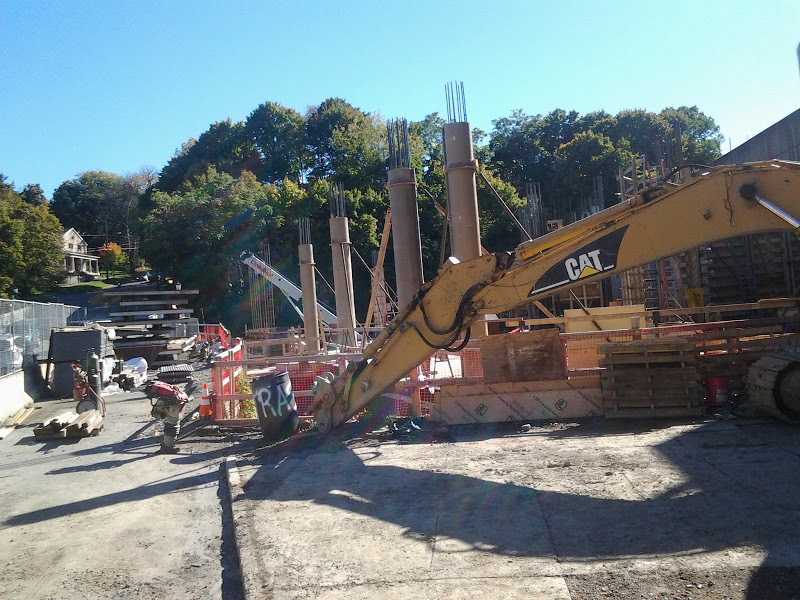 Cornell Heights and Cayuga Heights have been used as a textbook study in Blake Gumprecht – The former, for which this blog is named after, was founded as an elite faculty and businessmans’ enclave. But after the Alpha Zeta fraternity was donated a house in 1906 (for which the developer threatened legal action to no avail), and Cornell built the all-ladies Risley Hall in 1912, the local elite turned their noses and mostly turned tail for Cayuga Heights, selling out to Greek organizations but making deed restrictions in their new community to keep them from moving in. Cayuga Heights refused annexation in Ithaca by 1954 in part because they didn’t wish to attract students, and even prohibited a restaurant from opening for fear it would attract students as well. While the village isn’t as virulent as it once was, the sorority never really stood much of a chance. One long-term problem may be that if the existing GLOs do ever sell their properties, it’ll be to Cornell and Cornell only, where the use will be maintained, but the taxes won’t. Well ladies, better luck next time around. You could always ask Cornell about those houses on University Avenue. Vote. Local elections matter. Your vote on Tuesday could make the difference for a lot of things – for another 210 Hancock, waterfront development plans, zoning changes, or if a future downtown project gets an abatement. 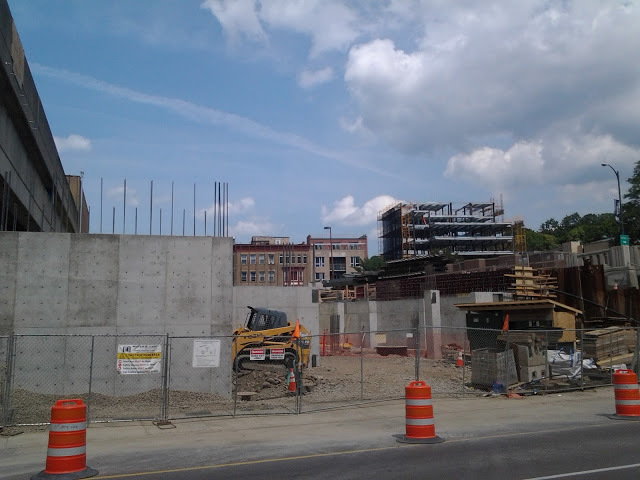 It will play a role in whether Ithaca, the county and other govs make an effort on affordable housing. Tuesday’s decisions will affect the city and county’s decisions. Polling sites here, sample ballots here. 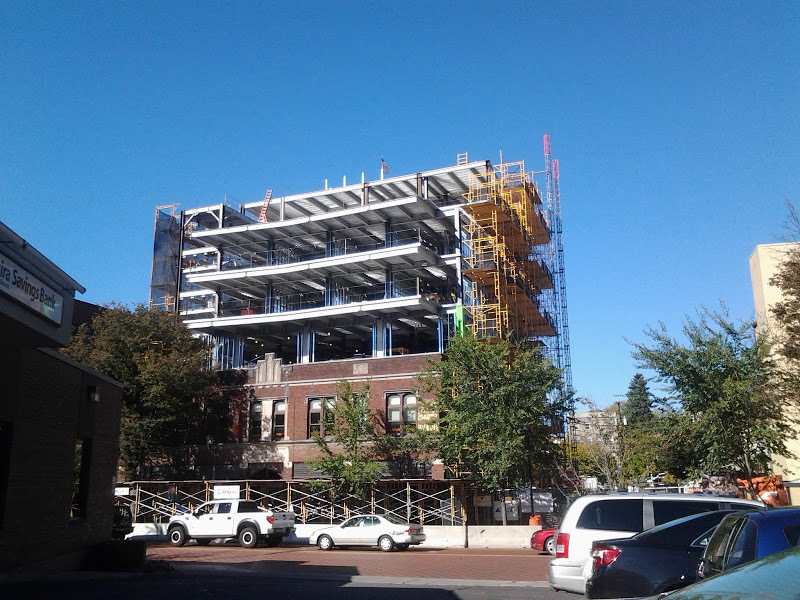 It looks like the Carey Building overbuild has topped out. 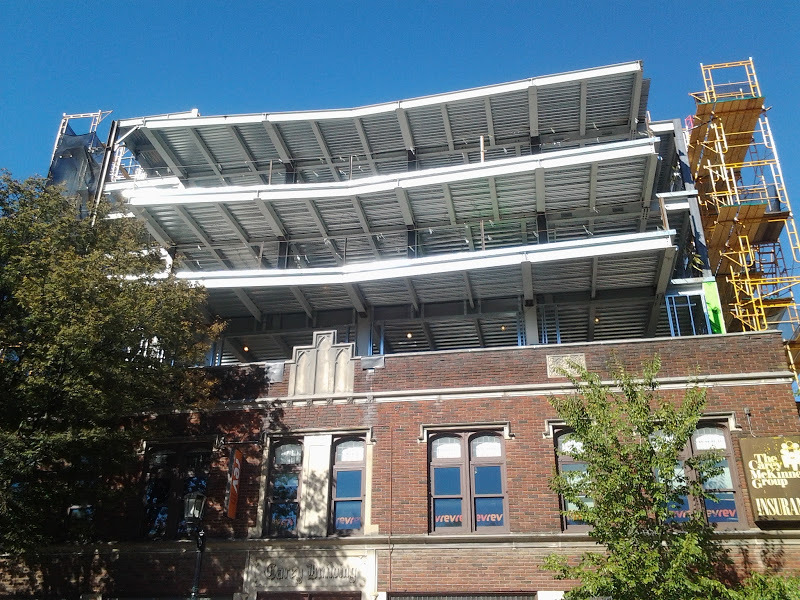 Corrugated metal decking now covers all five floors of the addition. 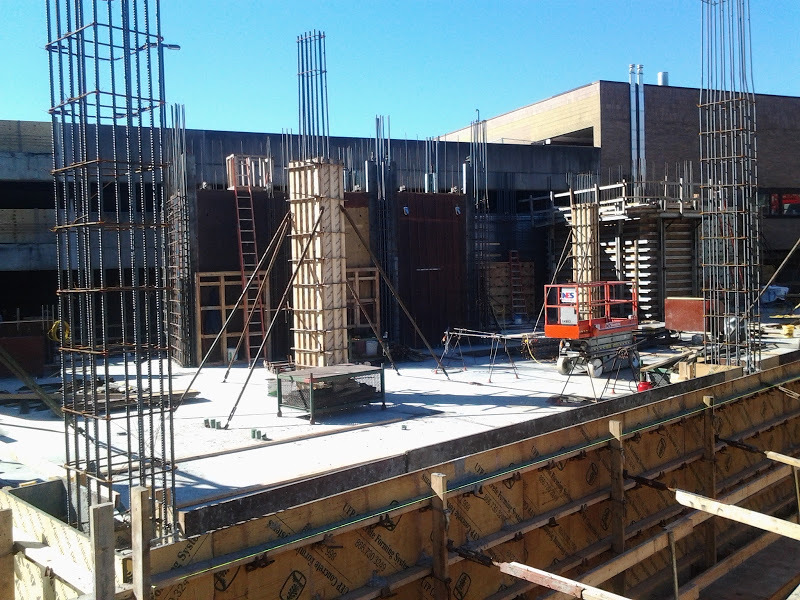 Interior metal stud walls have been roughed-in on the third through fifth floors, and some fiberglass-mat gypsum sheathing is even starting to show up on the exterior metal stud walls of the third floor. 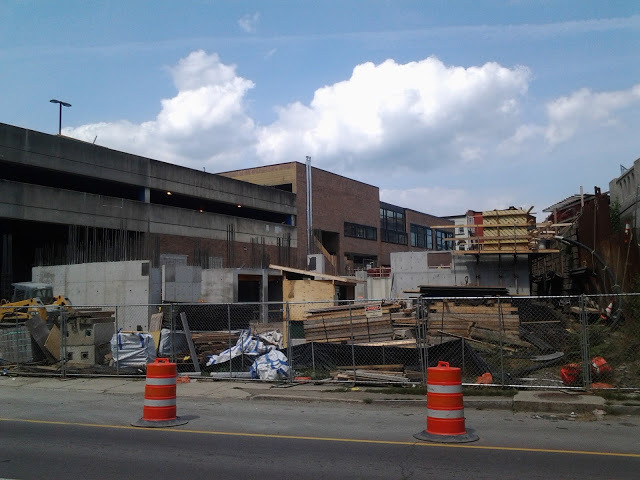 Look closely and you can see the window openings. 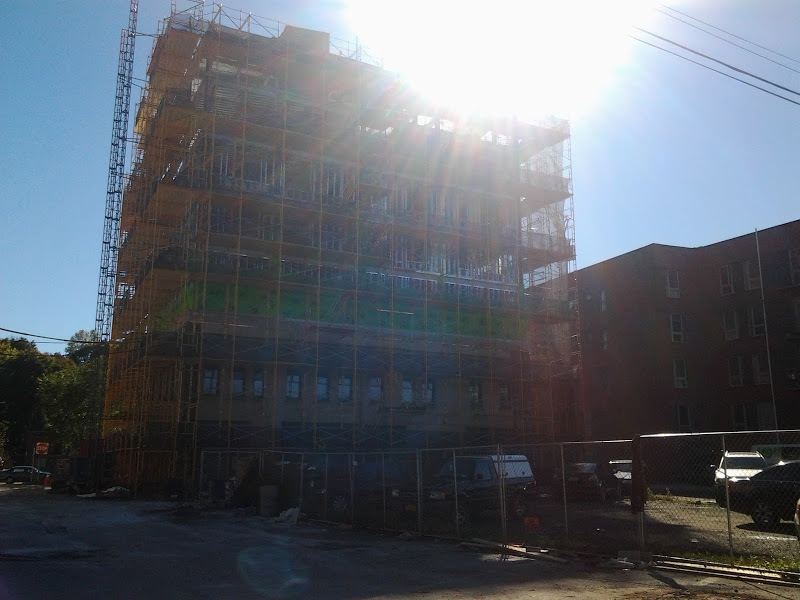 Looking at the Rev Business Incubator’s photo from the 19th, plastic sheeting now covers the front of the addition, and a little more progress has been made on those stud walls. 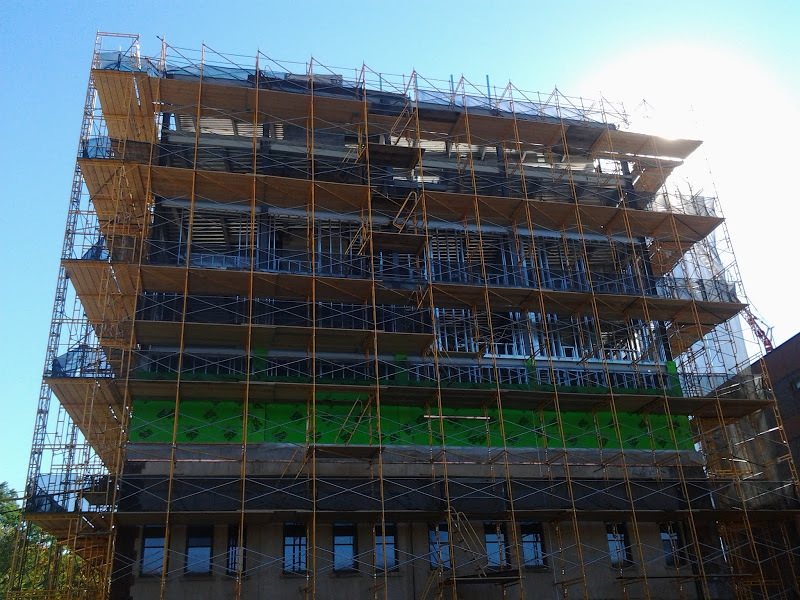 Like the Lofts project, they project may end up looking like it’s trapped in a plastic bubble as the cool air gets frostier, and the need to keep those chilly winds at bay becomes more urgent. They also help in water proofing. 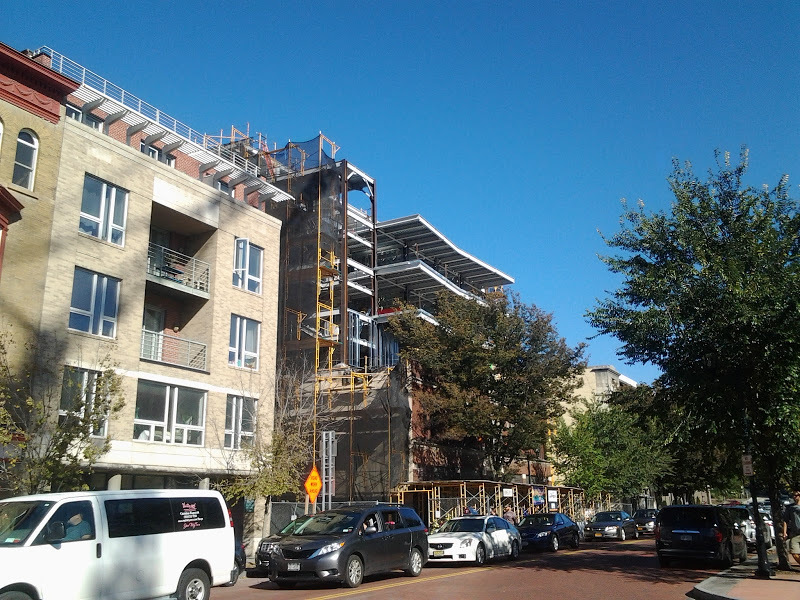 Turning the corner from 307 College, 205 Dryden (“Dryden South” for marketing purposes) is the third of Collegetown’s midrise apartment buildings under construction. 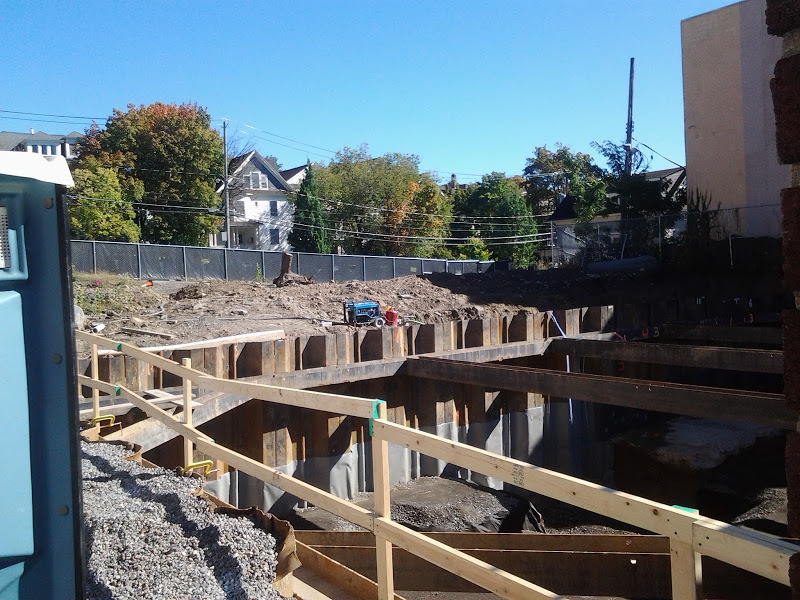 The basement has been excavated and sheet metal piles keep the surrounding soil from spilling back in. 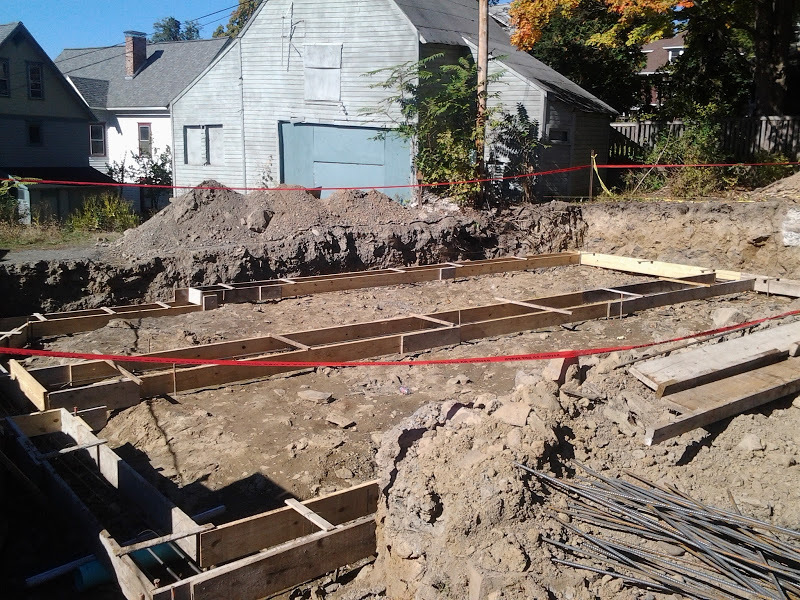 The basement will contain the mechanical room and storage space. 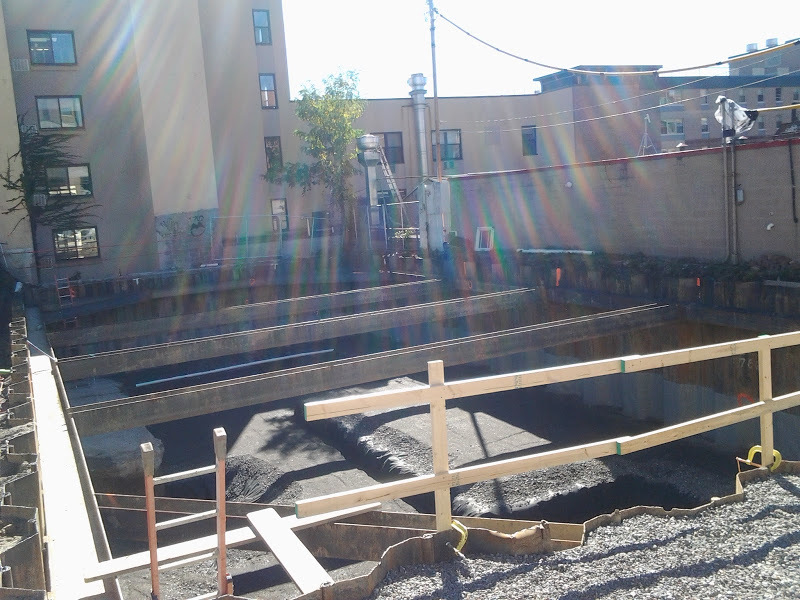 Structural steel has been erected up to street level. 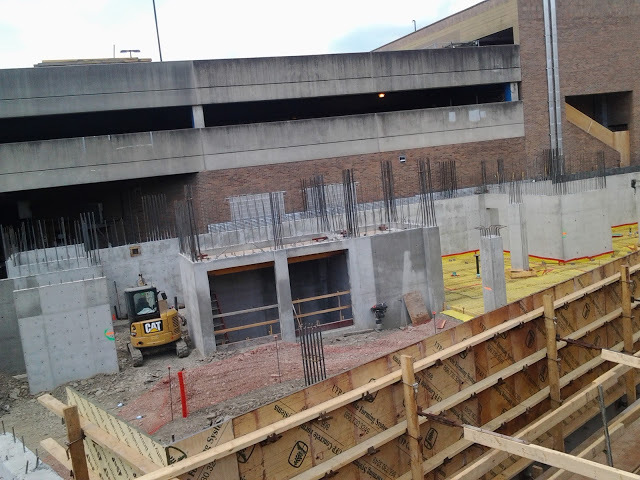 In the second image, the outlines of future interior basement walls and the base of the future elevator shaft can be seen. 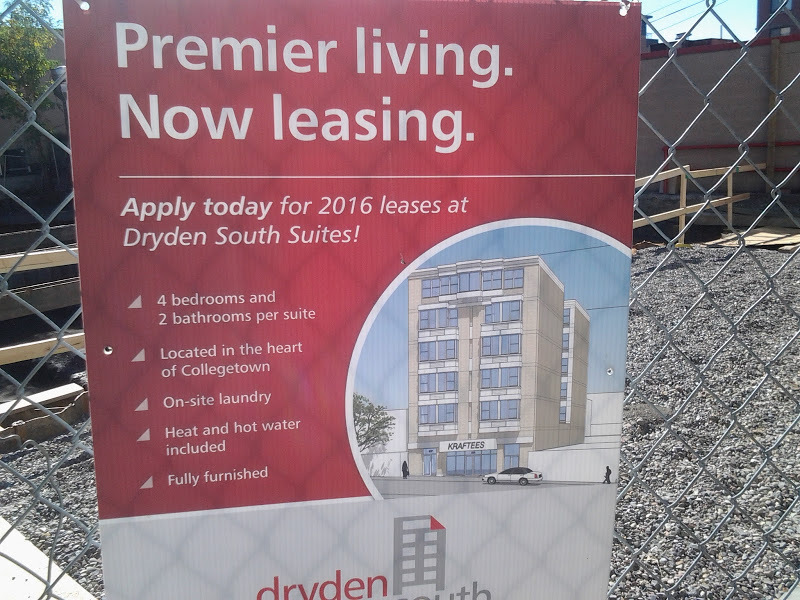 In what’s sure to stoke a few tempers, prices for Dryden South have been priced at $1350/bedroom per month, meaning $5400/month for each 4-bedroom unit. Incredibly expensive, but not especially surprising given the astronomically high land values in central Collegetown. Owner Pat Kraft, who also runs Kraftee’s book store, has actively marketed the apartments on Facebook, Craigslist and its own website. 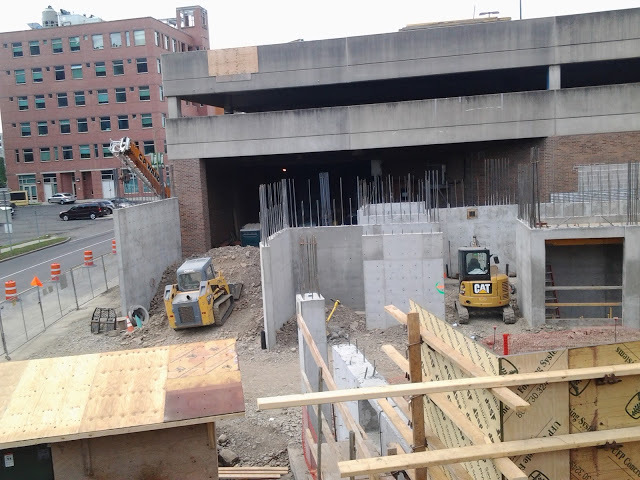 When completed in July/August 2016, the 6-story, 65-foot structure will house Kraftee’s in 2,400 SF of retail space on its ground floor, and 2 4-bedroom apartments on each of the upper five floors, for a total of 10 units and 40 bedrooms. 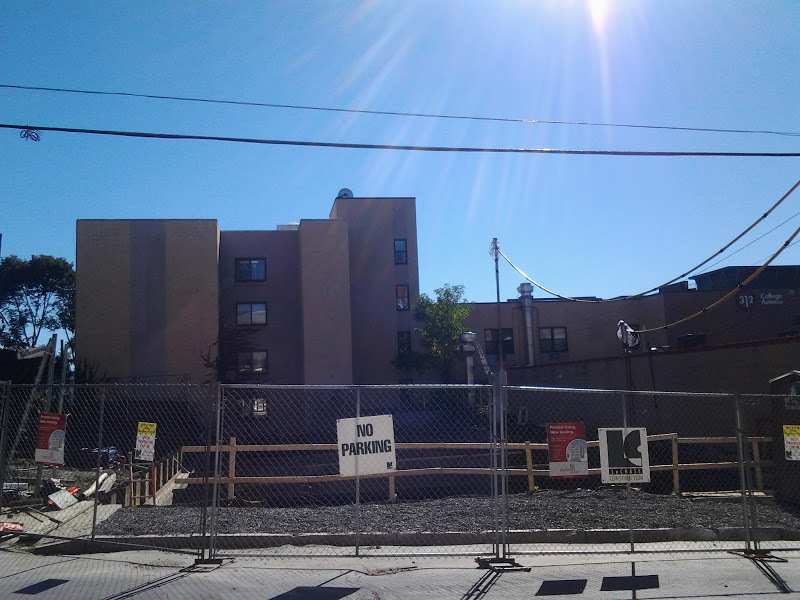 As you can tell from the first photo, apart from the demolition earlier this summer, work has yet to begin on John Novarr’s Collegetown Dryden project next door. 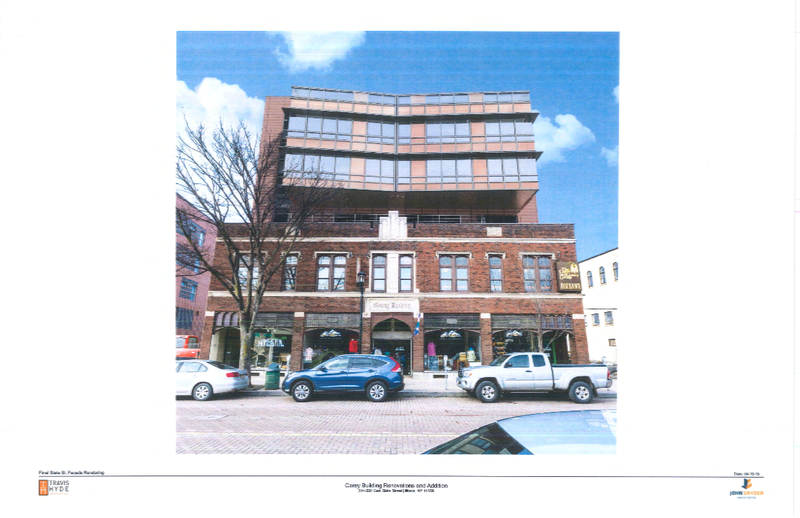 But with approvals in hand, that six-story research/office building will be starting something in the next month, if the site plan review document is still accurate. 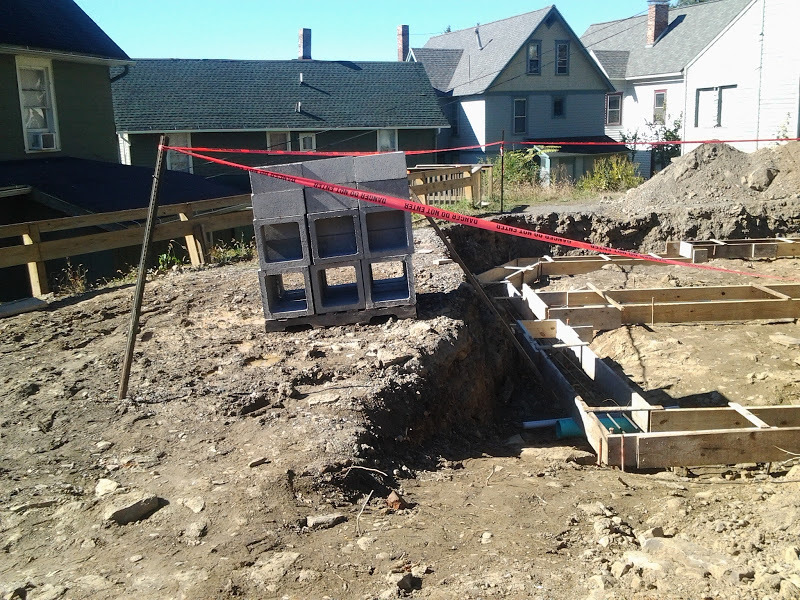 The $6.4 million project was designed by Ithaca architect Jagat Sharma and Rochester-based LeChase Contruction is in charge of the build-out.